Test your skills with this Crochet Rosebud Pattern. It’s perfect for your projects and we have a video tutorial to show you how. Check out all the amazing ideas now! 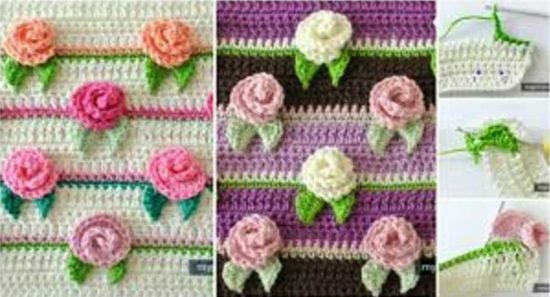 We were over the moon when we discovered this incredibly gorgeous Crochet Rosebud Border and we know that you will be keen to learn this new stitch. Imagine the ways you can incorporate in your projects. It would make a wonderful border on your blankets, or you could add them as a finishing touch to hats and even toys. If you love Roses, you may be amazed to know just how many gorgeous projects that we have on our site. We love this Cheeky Curler Crochet Hat and it's a fabulous free pattern that would make a wonderful homemade gift for family and friends. We've also included a video tutorial too. This is a fun project and it's easy peasy! View now. We've rounded up the cutest collection of Crochet Bib Free Patterns and there is something for everyone. They are adorable and very popular ideas and make great homemade gifts. Check them all out now. You'll be hooked on making this gorgeous crochet Lollipop Romper and it's a fabulous FREE Pattern. We've included some flip flop baby sandals for you to check out too. We've rounded up a collection of super cute little girl dresses and you will love them. We have plenty of free patterns in our post too. Check them all out now and Pin your favorites.